The Amphibious Assault Vehicle (AAV)—official designation AAV-7A1 (formerly known as LVT-7) is a fully tracked amphibious landing vehicle manufactured by FMC Corporation (now BAE Systems Land and Armaments). The AAV-7A1 is the current amphibious troop transport of the United States Marine Corps. It is used by USMC Assault Amphibian Battalions to land the surface assault elements of the landing force and their equipment in a single lift from assault shipping during amphibious operations to inland objectives and to conduct mechanized operations and related combat support in subsequent mechanized operations ashore. It is also operated by other forces. It was heavily used in the conflict in Iraq and has been criticized for providing poor protection for the crew and passengers compared with other vehicles such as the M2 Bradley. Several of them were disabled or destroyed during the Battle of Nasiriyah, where they faced RPG, mortar, tank and artillery fire. At least one vehicle was destroyed by fire from friendly A-10 Warthog attack planes. Eighteen Marines were lost. 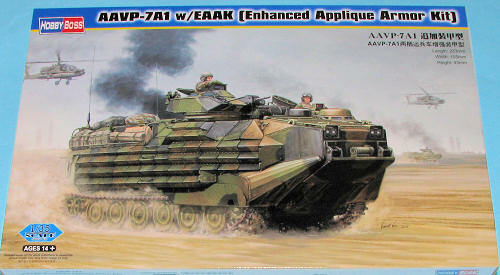 AAV-7A1s were also used extensively in the Persian Gulf War and in Operation Restore Hope. The AAV is slated to be replaced with theExpeditionary Fighting Vehicle starting in 2015. 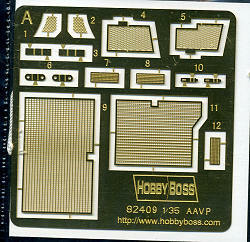 If you have built or seen any Hobby Boss armor kits, you know how nicely they are molded. This one is no exception. Like pretty much every new hobby kit, it is recommended for 14 and above. This is to prevent spurious litigation thanks to the new US Child Safety Laws. Upon opening the box, one is impressed with how much is crammed into it. 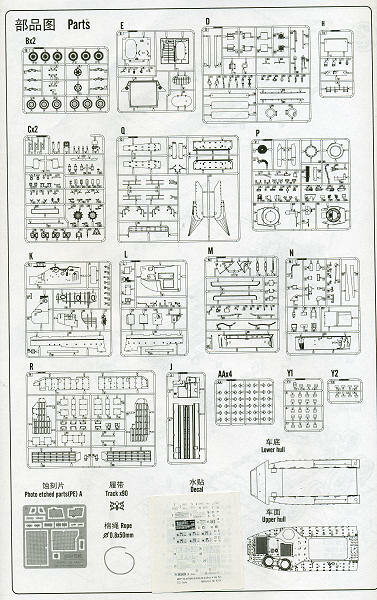 Most of the sprues are individually packaged to prevent scratches and broken parts. The hull and upper body work are separate moldings and very nicely done. Thanks to modern molding technology, no nasty s ink areas or injector pin marks (at least none that will be seen. The kit also includes a very nicely done photo etch fret that is used for engine screens and a few other small bits. Now the parts count is not provided, but I'd gather it to be in the 'many hundreds' category. Much of this thanks to the individual track links that also require the roller guide pins to be attached. There are 83 of those required and I think that is per side. Since the rear hatch can be posed open, you also get a full cabin interior with seats and fittings. 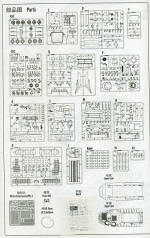 There is considerable interior side wall detail and a lot of pieces to attach thereon. All of the hatches can be posed open and the gun turret can be made to swivel as well. Then there is a Enhanced Appliqué Armor that goes on the outside. All of this takes two full instruction sheets, one of five double sided pages and one of four. There is also a full color painting and markings guide. This one has options for a standard vehicle and a KFOR Version. Both are in the green/black/brown variegated camo pattern. One thing for sure, this kit will provide hours of modeling pleasure and the end result will be a rather large and impressive model. My thanks to Squadron Products for the review kit. Get yours at your favorite shop or ask them to order it for you.